The all-consuming Superdelegates have secured their importance in the arms race to the nomination and now it’s time we found out where they stand. I’ve updated the Superdelegate Tracker just in time for the Ohio/Texas primary today, and once the results are in, we’ll most likely have a clear picture of who this primary season has favored. Even if she wins both Texas and Ohio, her delegate totals are only going to nominally increase, leaving Obama with a near 100 point lead despite her gains. If she were to stay in the race, her margin of victory in every other primary this year would have to be substantial (some estimates range at 70%) in order for her to beat Obama in elected delegate totals. 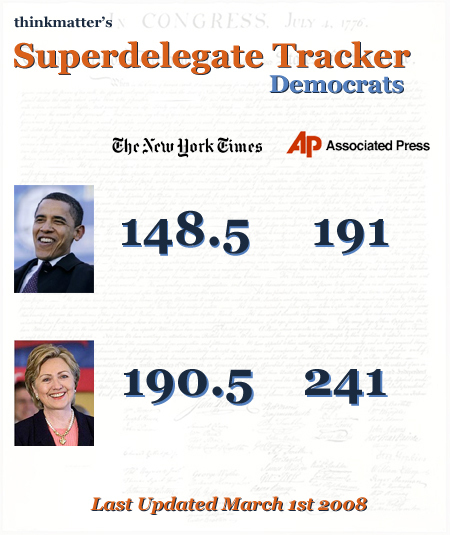 Her lead is lessening in Superdelegates, and some have jumped ship and gone to Obama. The Superdelegates are subscribing to the common wisdom that the party and the voters will not stand for a candidate who wins the nomination by the decree of unaccountable party members (i.e. themselves). 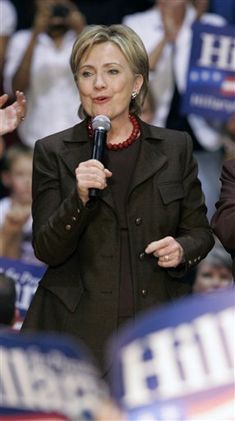 If Clinton is being truthful with herself, she knows that the Obama camp has made a good case that is slowly invading the thought process of the undecided Superdelegates. These folks realize that a protracted war for the nomination or denying the winner of the elected delegates the Big Prize would set the party’s national chances squarely at odds with the favorability it has achieved since 2006. The simple math goes like this: get a nominee soon and November looks great, fight this out or let the Superdelegates decide the nominee and race to November becomes mired in claims about legitimacy, party rules and the Dem nominee may be crippled from the outset. The Obama team was prescient enough to make this math clear early in February, and because his lead is solid enough now, it has little chance of backfiring on him. Superdelegates know and recognize this and it is one of the biggest reasons some of them are decamping from the Clinton wing. The only caveat that I will cite here is the popular vote totals. If Clinton can somehow overtake Obama in the popular vote once the primary process is over, she will have a convincing argument that she should be the nominee. In order for this to happen, she must win in Texas, Ohio and Pennsylvania to eek out a popular vote victory. If she does, she can easily argue that Obama might win in delegates, but much like Bush/Gore 2000, she should be the nominee because the plurality of votes nationwide are on her side. This of course is a big ‘what-if’ scenario and depends greatly on her success today. If it does happen, she still faces the danger of perception turning against her. She will, after all, be asking to be granted a party nomination outside of the rules the Democrats have laid out. Popular vote totals don’t make a nominee – delegates and Superdelegates do. Stranger things have happened, but if Clinton does grab victories in the remaining big states, it’s up to Obama to demonstrate that her claim to the nomination by popular vote is (I’m sorry to say) procedurally illegitimate.